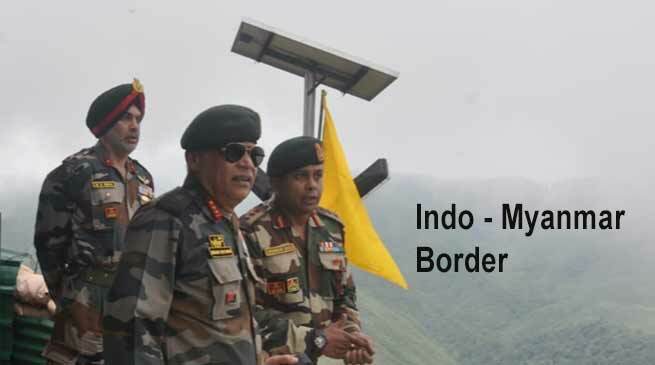 Lieutenant General Abhay Krishna, PVSM, UYSM, AVSM, SM, VSM, General Officer Commanding-in-Chief, Eastern Command as part of his ongoing visit of Spear Corps Zone, undertook assessment of Assam Rifles operations along the Indo- Myanmar International Border in Nagaland on 20 May 2018. General Abhay Krishna as part of the operational assessment visited the forward Assam Rifles post at Lungwa as well as the Assam Rifles Sector Headquarters at Tuensang. At these locations the General was briefed on ongoing operations by Assam Rifles commanders responsible for border management operations on the ground. The General Officer also interacted with the locals of these areas during the visit. For this visit General Krishna was accompanied by Lieutenant General Gopal R AVSM, SM, General Officer Commanding Spear Corps. Having expressed satisfaction and congratulating Assam Rifles troops for their hard work and operational acumen, General Abhay Krishna departed for Kolkata in the evening. The earlier scheduled visit of the Raksha Mantri, Mrs Nirmala Sitharaman to Spear Corps Zone, however did not materialise due to unforeseen technical contingencies.